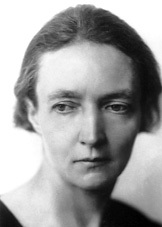 Irène Joliot-Curie (1897-1956) was a French scientist and 1935 Nobel Prize in Chemistry winner. While she was not a part of the Manhattan Project, her earlier research was instrumental in the creation of the atomic bomb. As the daughter of renowned scientists Marie and Pierre Curie, Irene developed an early interest in science. During World War I, she worked with her mother at the mobile field hospitals, operating the x-ray machines that her mother developed. Irene then returned to Paris to study chemistry at her parents’ Radium Institute where she wrote her doctoral thesis about radiation emitted by polonium. The same year, her future husband Frederic Joliot joined the Radium Institute. Like her parents, they decided to conduct research jointly. In 1933, the Joliot-Curies made the discovery that radioactive elements can be artificially produced from stable elements. This was done by exposing aluminum foil to alpha particles. When the radioactive source was removed, the Joliot-Curies discovered that the aluminum had become radioactive. For this research, the couple was awarded the Nobel Prize in Chemistry in 1935. This discovery had a significant impact and spurred research into radioisotopes and the practical applications of radiochemistry, especially in medicine. For example, researchers discovered isotopes such as a radioactive form of iodine, which was consequently used to treat thyroid diseases. Because the Joliot-Curies' discovery proved that radioactive isotopes could be made relatively inexpensively, the difficult task of separating naturally occurring radioactive isotopes from their ores was no longer necessary. 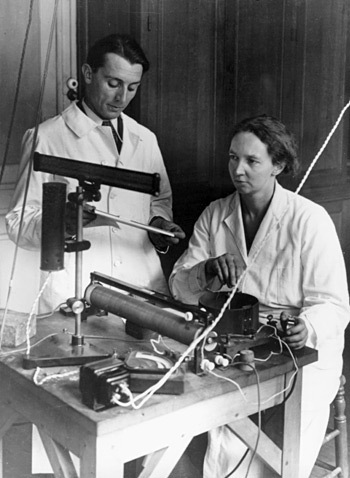 During World War II, Joliot-Curie spent time in Switzerland recovering from tuberculosis. She visited her family in occupied France until finally bringing her children with her to Switzerland in 1944. Two years later, she was named the director of the Radium Institute. At the age of 59, Joliot-Curie died of leukemia caused by years of radiation exposure. 1897 Sep 12th Born in Paris, France. 1925 Received Ph.D. in Chemistry from the University of Paris. 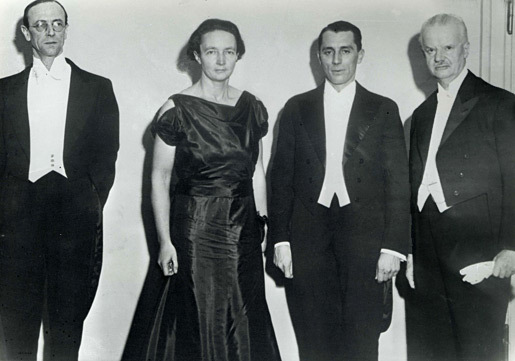 1935 Awarded the Nobel Prize in Chemistry for her discovery of artificial radioactivity.